Directorate of Forensic Science, Assam. Application are invited from the eligible candidate for filling up the following posts under Govt. 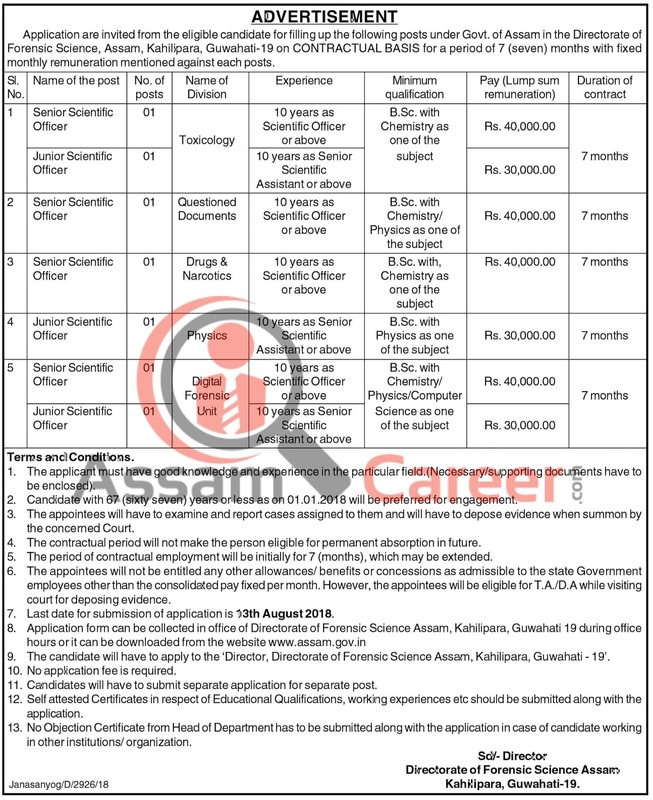 of Assam in the Directorate of Forensic Science, Assam, Kahilipara, Guwahati-19 on CONTRACTUAL BASIS for a period of 7 (seven) months with fixed monthly remuneration mentioned against each posts. Educational Qualification: B.Sc. with Chemistry/ Physics as one of the subject. 10 years as Scientific Officer or above. Educational Qualification: B.Sc. with, Chemistry as one of the subject. 10 years as Scientific Officer or above. Educational Qualification: B.Sc. with Physics as one of the subject. 10 years as Senior Scientific Assistant or above. Educational Qualification: B.Sc. with Chemistry/ Physics/Computer Science as one of the subject. 10 years as Scientific Officer or above. Age: Candidate with 67 (sixty seven) years or less as on 01.01.2018 will be preferred for engagement. The candidate will have to apply to the 'Director, Directorate of Forensic Science Assam, Kahilipara, Guwahati - 19'. Last date for submission of application is 13th August 2018. No application fee is required. Candidates will have to submit separate application for separate post. Self attested Certificates in respect of Educational Qualifications, working experiences etc should be submitted along with the application.